The inspiring story of the GB Paralympic athlete Martine Wright has been named Sports Autobiography of the Year at the 16th Sports Book Awards and will be a strong contender for overall Sports Book of the Year for 2018, which will be decided by a public vote. Written in collaboration with journalist Sue Mott, Unbroken, published by Simon & Schuster, tells the remarkable story of Martine’s incredible fight back from the horrors of the July 7 atrocities in London in 2005, when she was sharing a carriage on a tube train on the Circle Line with a suicide bomber, who detonated his device just outside Aldgate station. Seven passengers around her were killed among 52 who lost their lives that day but she survived, albeit at the cost of both her legs. 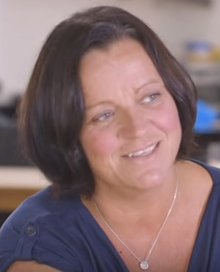 Martine, who took up wheelchair tennis and sitting volleyball as part of her rehabilitation, represented Great Britain in the latter at the 2012 Paralympics. Her story is one of trauma and tragedy but is also one of immense hope and the fortitude of the human spirit, not only in her sporting achievement but in rebuilding and even enriching her life in the years that followed. On Twitter, Martine said she was “still in shock” at being named as the winner of the award. She thanked family and friends for their help and support and in particular “the wonderful and very talented” Sue Mott. She was presented with her award at the awards ceremony at Lord’s Cricket Ground by Dame Katherine Grainger, the head of a judging panel that included the author of the 2017 Autobiography of the Year, Joey Barton, plus Simon Halliday, the chairman of European Rugby, Mail on Sunday sports editor Alison Kervin and Olympic champion Christine Ohuruogu. Unbroken beat off fierce competition, with former Formula One world champion Jenson Button, Yorkshire and England cricketer Jonny Bairstow, leading tennis coach Judy Murray, footballer Adebayo Akinfenwa and 13 times Isle of Man TT champion Michael Dunlop among those whose autobiographies were shortlisted. In the other categories, Wrecking Ball (Headline), by Saracens and England star Billy Vunipola, was awarded the London Sporting Club Rugby Book of the Year as judged by The Rugby Writers. James Montague’s examination of football’s super rich owners The Billionaires Club (Bloomsbury) won the Coutts Football Book of the Year, judged by The Football Writers’ Association. Montague’s book triumphed over a field that included studies of past and present managerial greats Sir Matt Busby, Mauricio Pochettino and Bob Paisley. A special award recognising Outstanding Contribution to Sports Writing was given to 92-year-old cricket writer John Woodcock, who was cricket correspondent for The Times for 35 years and edited Wisden Cricketers’ Almanack for seven years. Tributes to Woodcock were voiced by former England captain Michael Atherton, who is the current Times cricket correspondent and a Sky broadcaster, by Channel Five cricket broadcaster and former Hampshire batsman Mark Nicholas. Another former England captain and Sky pundit, the fast bowler Bob Willis, collected the award on Woodcock’s behalf. Over and Out (Pitch Publishing), Steve Neal’s story about Albert Trott, the Australian cricketer who was the first and, it is thought, the only player ever to have hit a ball over the top of the Lord’s Pavilion, was named The Heartaches Cricket Book of the Year, while Andy McGrath’s Tom Simpson: Bird on the Wire (Bloomsbury), which was the William Hill Sports Book of the Year last November, picked up The Full Time Cover Cycling Book of the Year award. The six-time champion jockey and three-time Derby Winner Kieren Fallon received the prize for Cross International Autobiography of the Year for Form: My Autobiography (Simon & Schuster), while Centaur (Transworld) another harrowing tale of fighting back from adversity written by Declan Murphy, the former jockey who was horrifically injured in a fall at Haydock Park in 1994, was named Right To Play General Outstanding Sports Book of the Year, with the award presented by Elise Christie, who is an ambassador for the charity, Right To Play. The Times Biography of the Year award was given to Ali: A Life (Simon & Schuster), Jonathan Eig’s comprehensive account of arguably the greatest ever sportsman, Muhammed Ali. The Thomson Reuters Illustrated Book of the Year went to The History Makers (Pitch Publishing), by Sarah Juggins and Richard Stainthorpe, the story of the incredible Olympic Gold medal success of the GB women’s hockey team. 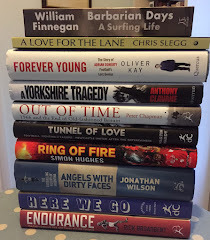 Each of the nine winning titles is now put to an online public vote to determine the overall Sports Book of the Year in association with The Times. Everyone who votes at www.sportsbookawards.com is entered into a prize draw to win £100 of National Book Tokens. The public vote is open for a week, until midday on Friday June 15, with the winner announced shortly afterwards. The title of your book is exciting me to buy your book as it is looking very informative. I am surely going to buy this book latest crispy sports news at any cost.